Nova Synthetics differ from other golden synthetics in their enhanced ability to hold water and color. Many other golden synthetics are glass smooth, but Nova synthetics use golden synthetic filaments of three different diameters with tiny ridges along the fibers that slow down the flow of water or color off the brush. These filaments have been specially shaped and tapered to adapt to the qualities of synthetic rather than natural hair. Nova Series 1570 Round brushes form a sharp point, hold water well, and are very responsive to a variety of waterbased media. They are available in a wide range of sizes. All feature nickel-plated, seamless brass ferrules that are resistant to rust. Nova Retouch (Series 5575) — Retouch brushes have the shape of a Round, but short fiber length and an extremely sharp point for maximum control. They are suitable for all waterbased media, including acrylic. Use them for placing small amounts of color very precisely. Another name for a Retouch brush is a Detailer. Nova Showcard Long Round (Series 1175) — The Showcard brush was an advertising sign painter's brush, longer and with a fuller belly to hold more color. 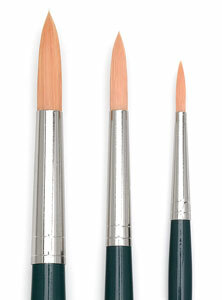 Nova Series 1175 brushes are extra long and have a more elastic point than typical rounds. The unique blend of different widths and lengths of synthetic fiber in Da Vinci Nova Synthetic Brushes enhances their color-carrying capacity. Each brush provides clean, even brushstrokes when used with oils, acrylics, watercolors, for mixed media, and for face and body painting. Sold in more than 90 countries, Nova Synthetics are the world’s top-selling brush for body painting. With fibers that are specially tapered to mimic the qualities of synthetic rather than natural hair, Nova Synthetics are extremely responsive for brushes in this price range. They provide unexpected elasticity and shape retention even after heavy use. Plus, they’re easy to clean.